The touching scene led to smiles and even tears for everyone who witnessed it. That emotional moment also helps explain the generous gift that the late Father Hilary Meny made to the endowment of Father Michael Shawe Memorial Jr./Sr. High School and Pope John XXIII School, both in Madison. As they headed to a state musical competition in 2014 in Evansville, Ind., the 45 members of Shawe’s first marching band made a special stop in nearby Haubstadt to salute Father Meny just shy of his 100th birthday. It was the band’s way of thanking and celebrating the priest, who led the efforts long ago to establish the two Catholic schools in Madison. As the students performed, Father Meny beamed and moved his hands like he was conducting the students. Father Meny’s love for the two schools is reflected in the gift that he left Shawe and Pope John after he died at the age of 101 in late 2016—a gift of $360,000 that was just recently announced. “It is fitting that Father Meny would choose to support the schools with a lasting legacy as he was instrumental with respect to Shawe being built and took a leadership position during the construction and opening of Pope John,” said Rob Barlow, president of the Friends of Shawe and Pope John Schools, a non‑profit organization that has established an endowment to support the long-term needs of the schools at Prince of Peace Parish. 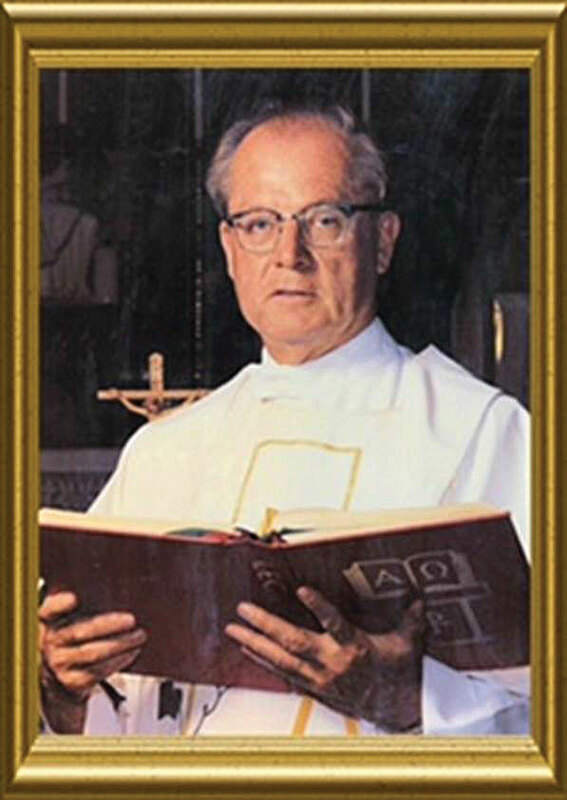 Father Meny’s connection to Madison began in 1949 when he became pastor of the former St. Patrick Parish. He served in the area for more than 40 years, according to Phil Kahn, president of the two Prince of Peace schools. With Father Meny’s gift, Shawe will create an annual fund of $10,000 to support the activities of the band, art and theater programs, Kahn said. A new sign will also be added to the front of the entrance to the Father Hilary Meny Gymnasium. And another $8,000 was used to buy a new stage curtain for the gym. One of Kahn’s favorite memories of Father Meny extends back to his youth.